Jordan Peele. Probably the last name you’d expect to hear attached to a horror or psychological thriller movie, mainly due to the success of his comedic endeavors KEANU and Comedy Central’s KEY AND PEELE. 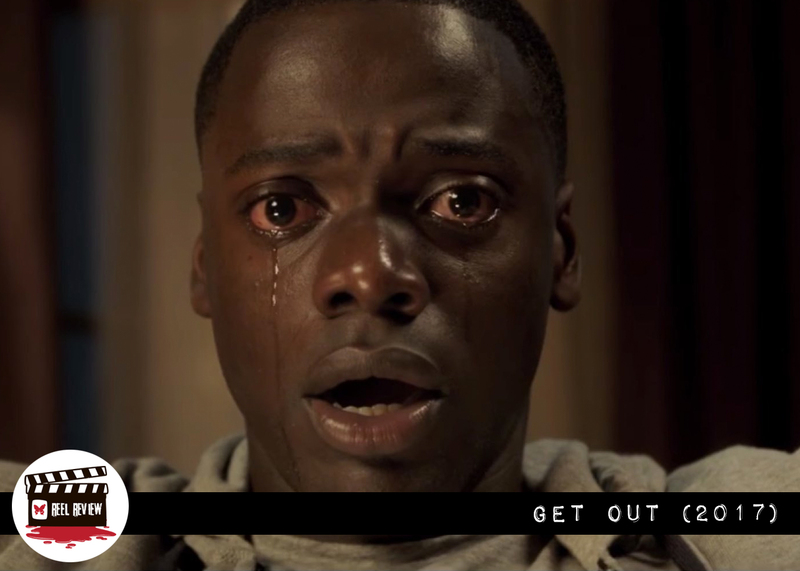 However, he has crafted one of the BEST FILMS in this infant year of 2017 with GET OUT. Let me repeat that statement…ONE OF THE BEST FILMS OF THE YEAR! Not just one of the best horror or psychological thrillers…one of the best movies overall. 100% on Rotten Tomatoes…believe the hype! Peele has created an instant classic with his film GET OUT, in which he makes his directorial debut from a script he also wrote. This will be a spoiler free review. There are many surprises to be had when viewing the film, and I will not be ruining this film for anyone. Chris Washington (Daniel Kaluuya) is a young African-American man going to meet his Caucasian girlfriend’s parents for the weekend for the first time. Chris is noticeably nervous prior to meeting Dean & Missy Armitage (played by Bradley Whitford and Catherine Keener), as Rose (Alison Williams) has neglected to tell her parents that Chris is black. Things don’t get better as a series of strange events make Chris start to question exactly what is going on at this house. During an annual gathering, things get even more strange, as many racial overtones hit Chris head on causing for an uncomfortable situation, that ends with a tense sense involving one of the party guests. Things go from bad to worse after Missy uses hypnotherapy to stop Chris from smoking cigarettes, and everything really starts to become clear for Chris and the audience. Not only is the audience aware that things aren’t as they seem, but Chris’ best friend, TSA Agent Rod (Milton “Lil Rel” Howery), also knows something stinks in Suburbia. To go any further would spoil the film, so my advice to all of you is go see this movie now! The timing couldn’t be better for a film of this magnitude. With all that’s currently going on in the country involving race and ethnicity, using horror and psychological thriller elements were the perfect way to tell this particular story. 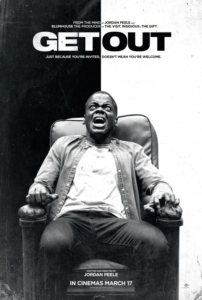 The movie is a slow burn with racial tension, psychological thrills and claustrophobic set pieces that completely deliver once the credits roll. One of the key components to GET OUT’s success is that it’s smart. It never once cheats the audience with ridiculous jump scares or insults our intelligence. It knows that we have seen horror movies before and manages to one up our expectations. It has been said that elements of the script are semi-autobiographical, and don’t think Peele completely tosses aside his comedic roots. In fact, not only is there a lot of dark humor, but Rod is the actual comic relief of the movie. Rod is arguably one of the best characters ever created for a horror movie…he’s like Marty in CABIN IN THE WOODS and Randy in SCREAM. Actually, the performances in this film are not only believable but completely top notch. This is some of the finest acting I’ve seen in a long time. Kaluuya brings a raw energy to Chris, and you’ll find yourself seriously rooting for him the entire time. The other actors will have you entranced as well and completely invested in each character’s arc throughout the film. Jordan Peele’s script and direction is second to none. He has such an eye for detail, and the dialogue is brilliant. This whole concept collapses if the script is weak. Thankfully, Peele is firing on all cylinders. Everything about this film works, and it’s all thanks to Peele’s keen sense of awareness. In fact, I promise none of you will look at a teacup and spoon quite the same way again. It’s actually a shame that this did not come out as a limited release in December, as this film could’ve easily been a contender during awards season. It’s that good! I can’t heap enough praise on this film. I honestly can’t wait to own this on Blu Ray.Universal Pictures and Blumhouse have a winner on their hands, and Jordan Peele has officially put the horror community on notice. If this trend continues, Blumhouse’s upcoming HALLOWEEN reboot/sequel being written by Danny McBride should be yet another winner. This movie gets my rare 5 out 5 stars rating. Now GET OUT there and see this movie!